He is a boy and weighs already over 800 grams. The first cub of the Red Panda couple at Korkeasaari Zoo, the Helsinki Zoo in Finland, is still fully dependent on his mother. But the Red Panda boy will start exploring his surroundings with his own feet in September or October. 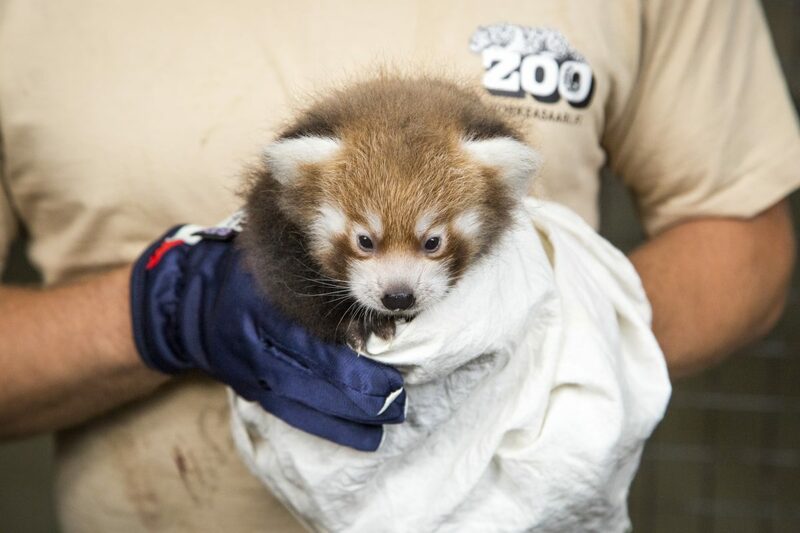 The zoo keepers have left all the caring work for the female Red Panda. Some days ago the young Red Panda was quickly checked by the zoo vet. He got an identification chip and was dewormed. Helsinki Zoo takes part in the conservation of Red Pandas by raising funds for Red Panda Network and is also part of the endangered species conservation programme of the zoos, which tries to create a healthy zoo population. In recent years Red Pandas have got more cubs than earlier. The previous Red Panda cub of Helsinki Zoo was born seven years ago. Helsinki Zoo’s flickr page has more photos of the cub.